A family of Canada geese travelling across the High Level Bridge caused a bit of a traffic slowdown Monday. Spring hatching is in full swing. Some geese are finding nesting spots in urban Edmonton settings. An eight-member family of Canada geese travelling across the High Level Bridge caused a bit of a traffic slowdown Monday morning. Edmontonians were quick to step in and try and help the mother, father and six goslings once they realized that the birds were trapped. The goslings had got onto the roadway at the north end of the bridge and couldn't climb back up onto the sidewalk by themselves. That led the feathered family to move further out onto the bridge as the parents tried to find a place to get their goslings to safety. Luckily for them, they had some human assistance. "Well, we can either walk on and forget about the goslings and one of them will get squished or we can do something now — and we chose to do something now," said Lynette Stanley-Maddocks. Stanley-Maddocks and Jen Russill were out for a walk when they saw Angel Sundresh trying to assist the lost birds. Stanley-Maddocks and Russill found a small road sign and tried to use it as a ramp to get the goslings up onto the walking path and out of traffic. But the birds were not eager to use it and kept moving further onto the bridge. So, with Sundresh, they used the sign to herd the birds into a single lane and started the long journey across the bridge as traffic squeezed into a single lane to get by. "A lot of people drove by and said this was the best reason ever to be stuck in traffic, or it was rare that a traffic jam could make them smile, so it all turned out for the best," said Russill. After an hour and a half of geese herding, they finally managed to get the birds across to the south end of the bridge. From there the family of geese went into the brush on the west side. Their human helpers hugged and thanked each other for committing to assisting those in need — even if the geese hissed every time they got too close. "It feels awesome because they are pushed out to live on our streets and because of all the development here, sometimes they get stuck with human world," Sundresh said. "So it feels nice to get them back into their world where they are safe." Canada geese habitually make Alberta home when they are nesting. Decks, balconies and rooftops are popular nesting spots. Geese like them because they offer safety from predators. This leads to some up close encounters with people surprised to find the geese claiming space to lay their eggs. 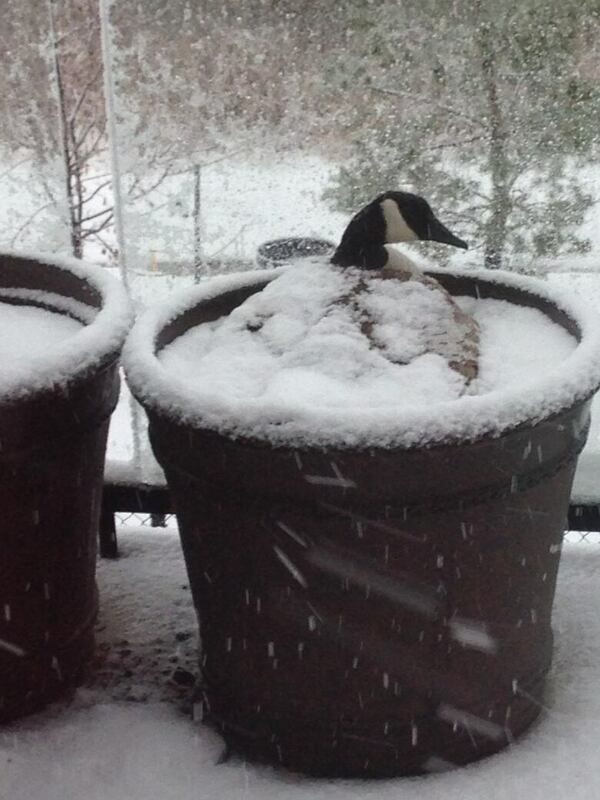 For the past four years, Canada geese have tried to nest on Maggie Taylor's deck in the Terwillegar neighbourhood. Taylor and her husband went out for dinner at the beginning of April and when they returned, discovered a new feathered neighbour had laid eggs in a plant pot on their balcony. "I'm happy, actually," Taylor said. "At first we weren't sure what to expect." They've learned a lot about the migratory birds since the goose moved in. They watched her nest, never leaving her post, even covered in a spring snow storm. Her mate lives in a nearby pond. The family named the duo Bonnie and Clyde, because they fought so hard for a spot on the deck. It is illegal to move Canada geese once they have nested, as they are protected under the Migratory Birds Convention Act. That leaves property owners with new guests. Canada geese will also try to nest in the same spot every year, so it won't surprise Taylor if hers come back again next spring. "They are living creatures so I wouldn't harm them. So we give up the deck for a month, no big deal."